So the garden is shutting down. Pretty soon we get out the seed catalogs and gear up to start seedlings. But for the moment it’s not a bad idea to stop and daydream. I could do that. But it’s not a bad idea to just daydream about the high moments of last summer’s garden, and take a break, instead of starting a new project. Suburban growers are lucky to be able to take a few months off and exist on the plentiful supply of produce that suburban grocerystores provide, and remember the season’s highlights. 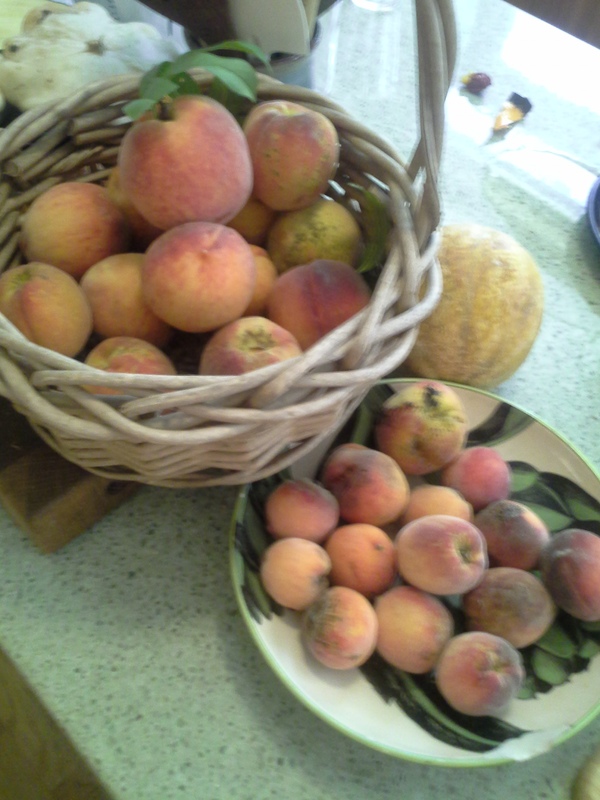 Last summer, we had unbelievable peaches, mostly a gift of the micro climate in my backyard..and the fiesty bulldog puppy chasing squirrels away. Can it happen again? Will our peach trees fight their way this year through Maryland humidity? Will I get that Surround product out and spray it on early, to give the fruit its best chance at survival? Our peaches and a MELON! !